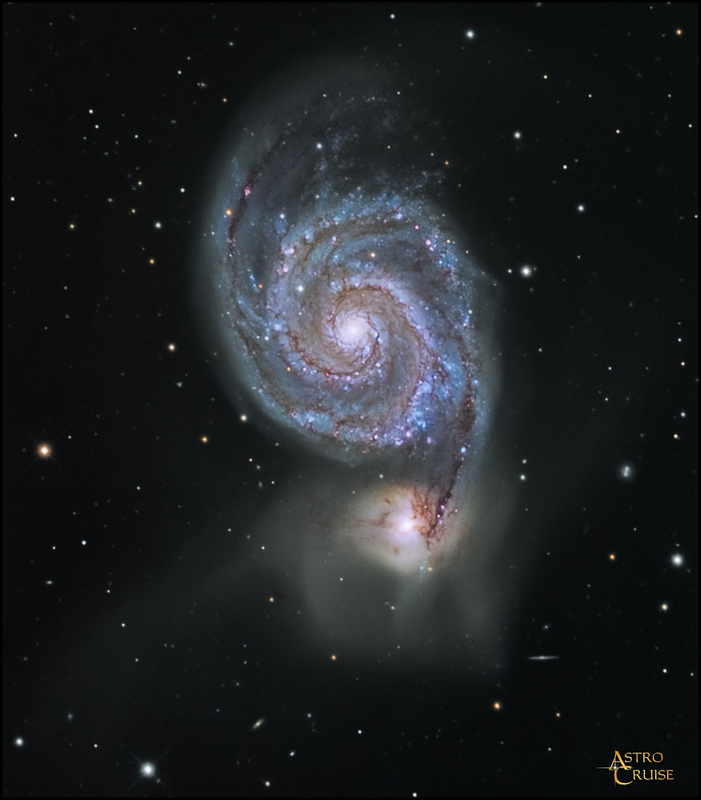 Object data: M51, the 'Whirlpool Galaxy' in Canes Venatici is famous for its beautiful spiral structure, first noted by Lord Rosse in 1845. It was discovered by Messier in October 1773 and catalogued by him in January 1774. Its companion galaxy, NGC 5195, (seen below M51 in this image) was discovered in 1781 by Messier's colleague, P. Mechain. The M51 system is a spectacular example of interacting galaxies - in this case NGC 5195 is being "ripped apart" by the huge gravitational disturbance of M51, while M51 has in turn undergone huge structural alteration from the gravitational effects of NGC 5195. The distance of M51 is estimated to be about 37 million light years. The diameter is approximately 100,000 light years and the total mass is estmated to be the equivalent of 160 billion suns. Exposure: LRGB Seq: 14x 20 minutes; 3x 20 : 13 : 20 minutes (binned 2x2). Processing: Image acquisition, calibration, combining, and DDP were done using Maxim DL, registration of Luminance and RGB images was done using Registar, and final processing was done in Photoshop CS4. Notes: This image replaces my image of M51 from seven years ago, taken in April 2003 from Wiltshire, England - click here to see it. According to star measurements in CCDOps the seeing was around 2.1 arc seconds for the above image, compared to 2.2 arc seconds for the earlier image. This is another of those images (like M101) where I was able to start with the telescope well to the east of the mount (and under the mount), which enabled me to complete the entire five hour imaging sequence without ever having to stop and flip the mount - a tremendous advantage of Astro-Physics mounts. Please see a new article on this capability.